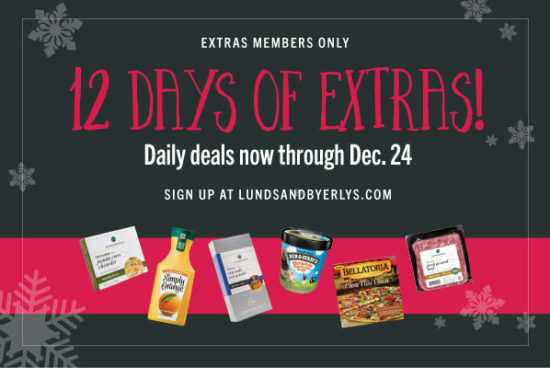 Lunds & Byerlys 12 Days of Extras kicks off today with a new daily deal each day for L&B Extras members! (It’s free to join if you haven’t already.) As far as I can tell, it looks like no additional purchase is required to get the sale prices. Limit 2 lbs. Offer valid Dec. 13, 2018. Offer valid Dec. 14, 2018. 9 inch. Limit 2. Offer valid Dec. 15, 2018. 6.5-8 oz. Limit 2. Offer valid Dec. 16, 2018. Excludes organic. Limit 2 lbs. Offer valid Dec. 17, 2018. 16 oz. Limit 2. Offer valid Dec. 18, 2018. 1 lb. Limit 2. Offer valid Dec. 19, 2018. 12 inch. Limit 2. Offer valid Dec. 20, 2018. 10 oz. Limit 4. Offer valid Dec. 21, 2018. 52 oz. Limit 2. Offer valid December 22, 2018. Excludes microwavable. 12-16 oz. Limit 2. Offer valid Dec. 23, 2018. 25.4 oz. Limit 2. Offer valid Dec. 24, 2018. They also have deals on Wines & Spirits at select locations.